Will this give UKIP’s minority of aggressive commenters food for thought? Every so often one comes across something that is a little witty and makes one think. 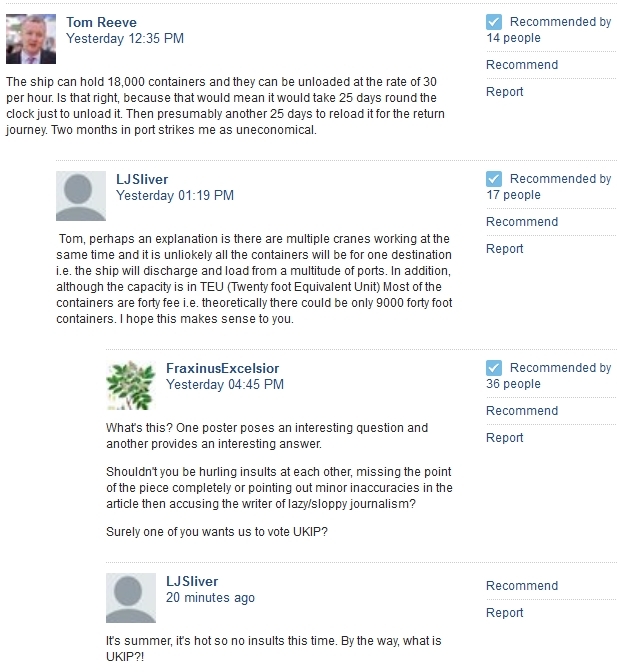 Below is a screengrab of a comment exchange from the Telegraph about a story on Maersk’s new huge EEE container vessel. While the vast majority of UKIP supporters are super people and receptive to others’ ideas and views, having been on the receiving end of the cultist wing of the UKIP commentista on the pages of the Telegraph (a small band of aggressive UKIP supporters with a particularly obsessive zeal and intolerance for anything that does not perfectly match their ideals and vision), comment three certainly resonated. One wonders what the large number of non-commenting readers of comment threads in the Telegraph must think of the yah-boo stuff that gets plastered digitally on that website. Do the cultists ever stop to wonder how they come across to the silent majority? Food for thought for some, perhaps? Er … don’t quite know how to react to that.